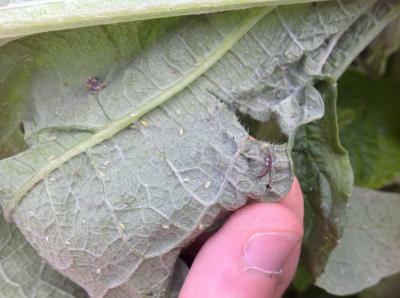 Beware Aphids; the aphid lions are out ferociously eating about 400 of you in one week. However, the larvae of green lacewings (Crysoperla or Chrysopa spp.) also known as the aphid lion have a plethora of other beneficial insects to compete with. Lady bugs, parasitic wasps, minute pirate bugs, Hover fly larvae, predator stink bugs, praying mantis, assassin bugs and damsel bugs are just some of the beneficial insects you will attract to your garden if you have aphids. Most Master Gardeners agree with the University of Illinois Extension Horticulture Educator, Kelly Allsup, when she says to abstain from treating for aphids with chemical sprays. Aphids are phloem feeders, plant sap suckers, and congregate on the growing tips of your garden plants or on the underside of the leaves. They are small and round and produce frass (excrement) called honey dew. Honey dew collects on the plant leaves making them sticky. The aphid population in your garden will build at a very high rate due to asexual reproduction by the females, giving birth to already pregnant clones. A female aphid can produce 5-12 offspring in one day. Don't fret lovers of garden plants, the infantry will arrive lead by the ravenous larvae of the delicate green lacewing. Green lace wing are about as big as the tip of your pinky with green bodies, golden eyes and intricate lace wing they hold upright over their bodies. The green lace wing adult will fly from flower to flower in your garden eating nectar, pollen, honeydew and small insects. When an adult female comes across patch of honeydew and aphids she will stop to lay her eggs. The white oval eggs are connected to the plant by a thin filament. As soon as the green lacewing larvae (aphid lion) hatch they begin eating immediately waving their heads around eating whatever they catch. Thanks to mom's good planning, aphids will be plentiful. Aphid lions look more like miniature alligators than lions. The larvae will eat spider mites, small caterpillars, thrips, mealy bugs, whitefly and other soft bodied invertebrates with the hooked jaws protruding from their heads. They inject digestive juices in prey so they may slurp up there dinner. Aphid lions will eat for 1-2 weeks before pupating. 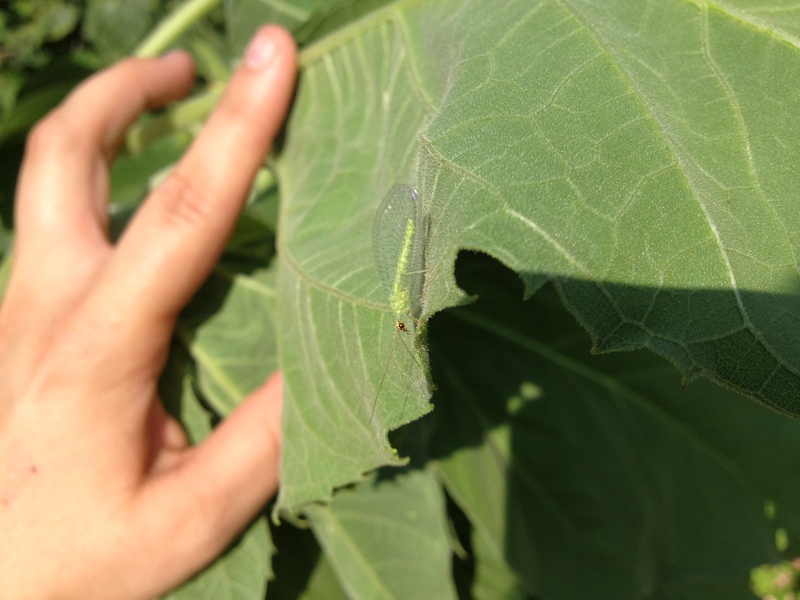 Forming a white round silken cocoon on the underside, adult green lace wings will emerge and live for 2-3 months. Depending on which, green lace wing genus the insect either overwinters in bark crevices or protected locations as adults or in the pre-pupae stage. They emerge next spring when flowers appear. Contingent on the temperature and weather of the season, there can be 1-4 generations per year. An infestation of aphids could be just what your garden needs to increase diversity. Not only will the aphid population attract beneficial insects and pollinators but the birds, bats and larger insects looking to dine on them. Many chemicals labeled for garden use can be detrimental on this population of insects and will prevent their return. It is advised to only treat if you see severe plant decline or suspect aphids or phloem feeders are transmitting disease. First step should utilize cultural methods like water sprays or biopesticides like soap or neem oil. An alternative to chemical sprays is releasing beneficial insects bought online. Ultimately, inspect your garden plants and look for signs of garden pests and the beneficial insects that prey on them.